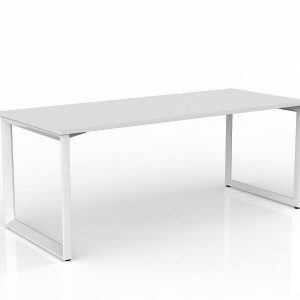 Anvil 90 degree workstation with worktop size of 1800mm x 1800mm/600mm. White or black powdercoated 50mm x 50mm x 50mm triangle frame, 50mm x 25mm rails. 25mm Studio White worktop with ABS edge. 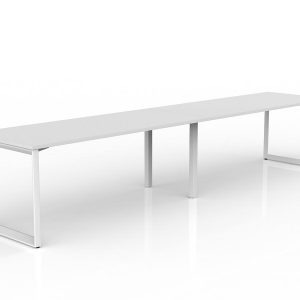 Anvil 120 degree workstation with worktop size of 1200mm/600mm x 1200mm/600mm. White or black powdercoated 50mm x 50mm x 50mm triangle frame, 50mm x 25mm rails . 25mm Studio White worktop with ABS edge. 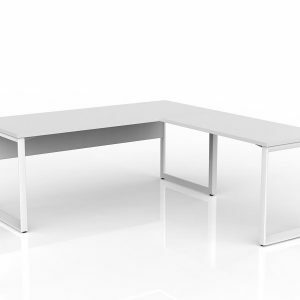 Anvil Shared Singlesided Straightline Desk layout with 2 worktops of 1200mm x 600mm. White or black powdercoated 50mm x 50mm x 50mm triangle frame, 50mm x 25mm rail. 25mm Studio White worktop with ABS edge. 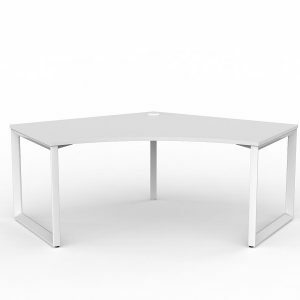 Anvil Shared Doublesided Straightline Desk layout with 2 worktops of 1200mm x 600mm. White or black powdercoated 50mm x 50mm frame, 50mm x 25mm rail, 80mm height adjustment in each foot. 25mm Studio White worktop with ABS edge. Excludes Cable Management and screens. 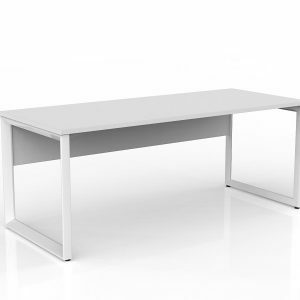 Anvil 1800mm x 600mm desk with 1200mm x 600mm desk return. White or black powdercoated 50mm x 50mm x 50mm triangle frame, 50mm x 25mm rails. 25mm Studio White worktop with ABS edge. 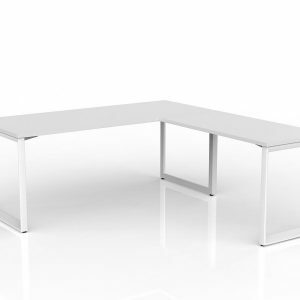 Anvil Shared Singlesided Straightline Desk layout with 3 worktops of 1200mm x 600mm. White or black powdercoated 50mm x 50mm x 50mm triangle frame, 50mm x 25mm rail. 25mm Studio White worktop with ABS edge. 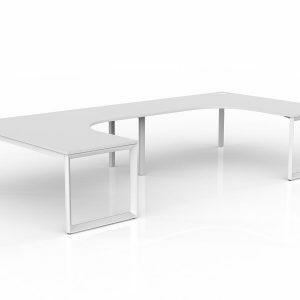 Anvil Shared 90 degree workstation U-shape layout with 2 worktops of 1800mm x 1800mm/600mm. 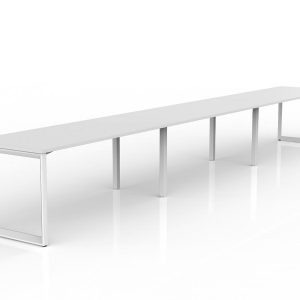 White powdercoated 50mm x 50mm frame, 50mm x 25mm rails, 80mm height adjustment in each foot. 25mm Studio White worktop with ABS edge. 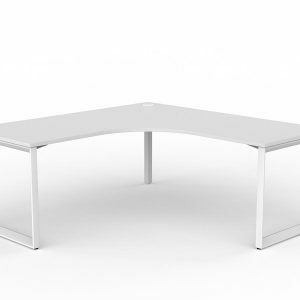 Anvil Shared Doublesided Straightline Desk layout with 2 worktops of 1200mm x 600mm. Black Powdercoated 50mm x 50mm x 50mm triangle frame, 50mm x 25mm rail. 25mm Studio White worktop with ABS edge. 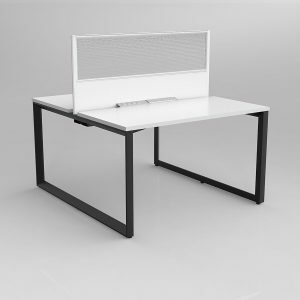 Includes solid, segregated cable management trays, above desk power & data service mounting plates to each desktop, central divider screen in translucent twinwall PVC to top 300mm. 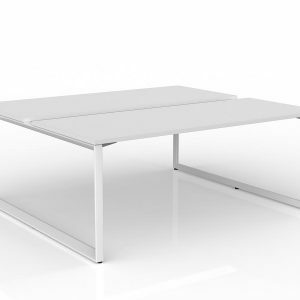 Anvil Shared Doublesided Straightline Desk layout with 2 worktops of 1200mm x 600mm. White Powdercoated 50mm x 50mm x 50mm triangle frame, 50mm x 25mm rail. 25mm Studio White worktop with ABS edge. 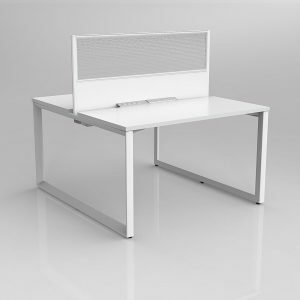 Includes solid, segregated cable management trays, above desk power & data service mounting plates to each desktop. Central divider screen in translucent PVC to top 300mm.